In 1893, Ymir was called Quartz Creek. The southern part of Ymir was built first, along what was known as Quartz Creek. In 1893, the Fort Shepherd and Nelson Railroad came through Ymir. They opened up a town site that year that was the nucleus of the Ymir of today. The railroad named the town of Ymir after a god of that name that is a part of Norse mythology. 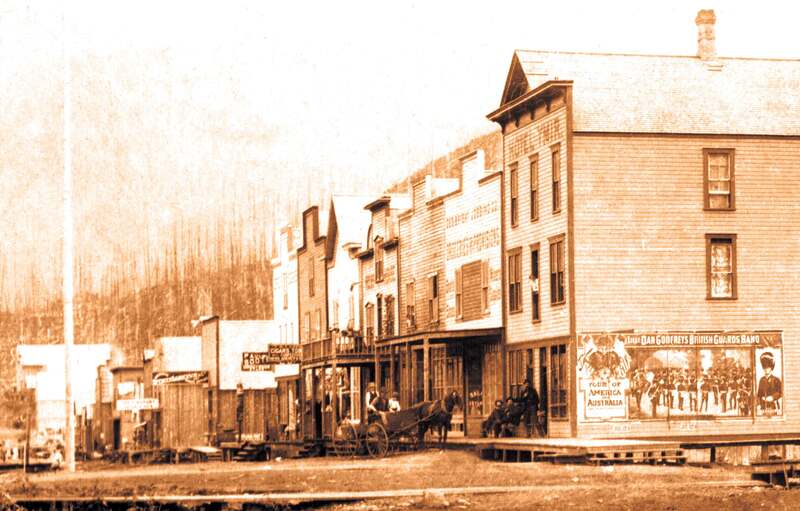 One of the buildings of the old town of Quartz Creek was moved to Ymir. This building is now owned by Mr. Hoplind, and was moved by Pete Peters, who was known as “Pete the Packer”. Across the front of the building was painted “Pete the Packer’s”. There was a bar on the lower floor of the building and rooms overhead. There was also a brewery in Ymir that supplied the eight saloons that flourished in Ymir. The owner’s name was Chris; he was of German descent. Around the year 1900, a woman drowned herself in the town’s water tank. The water tank was replaced after this happened. The present schoolhouse is on the original site. The old school was burned in 1936 and replaced by the present building. Up until 1925 Ymir had one of the best hospitals in the Kootenays. It burned down in 1933. There was an aura of mystery on the fire’s origin. Many thought it was burned down purposely. The steam trains used to come through with the freight and passenger service and there was a water tank on the mouth of Quartz Creek, right in front of the present day Ramble Inn. In the wintertime when it was cold and there would be heavy snows, the trains would be late getting in at night. When they did make it in, they would whistle for the operator to come to the station. They not only woke him up but also the whole town! Ymir had a large, nice-looking depot and warehouse. The first mining claim in the Ymir district was located in 1893 on Porcupine Creek. The old mines are still there today. They were known as the Porcupine and the Porcupine. The time the Ymir Gold Mine was opened was after this, in 1897. When the eighty stamp mill was built at the Ymir mine, it was the largest stamp mill in the British Empire, so one can see that Ymir was known across the country. The first Provincial Policeman in Ymir was named Captain Forester. There was a big fire in 1903, right in front of the town where the Yankee Girl Mines tramline comes down. The Ymir Mine closed down in 1907. During the years of 1932 to 1942 there were operating mines around Ymir, numbering thirteen. Some had large crews, like the Yankee Girl. The out break of World War II caused most to close . Supplies couldn’t be acquired for operating gold mines. There was a very bad fire in 1922 near Porcupine valley. Some men and lots of horses and other animals died in this fire. The classiest hotel in Ymir was the Cosmopolitan. This was among eight hotels operating at the time. Mr. J. Dunn then owned the grocery store now operated by Mrs. H. Burgess. There was some trouble at the Cosmopolitan Hotel. The owner shot a man during it’s operating time over an argument that was done in self-defence. The grocery store was owned by Mr. J. Dunn and his partner from 1935 to 1958. There were two churches in town. One caved in with the snow one year and he other still stands today. It is the Roman Catholic Church. Many of the descendents of that time still live in the Kootenays today. The first fire through here was in 1903. Burgess’s store used to be a bank and was located at what is now Nord’s Garage. Ymir had a newspaper called the Ymir Herald in 1906. Ed Emilson still has a copy.